Hi all! And a Very Happy Sweet Stop Sketch Saturday to you! 8-) Hope you all had a Wonderful week! Mine's been busy busy creating in my crafts room, attempting to keep one of my personal resolutions for this year to participate in more challenges and to incorporate more sketch challenges as well! ( Love working off sketches!) 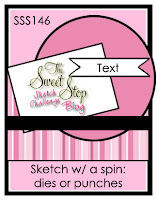 Well, today I'm back with the latest Sweet Stop Sketch Challenge, Yay! And since it's the third Saturday of the Month,we have a fun spin for you too, so you know there's a Terrific prize up for grabs to one very lucky winner! 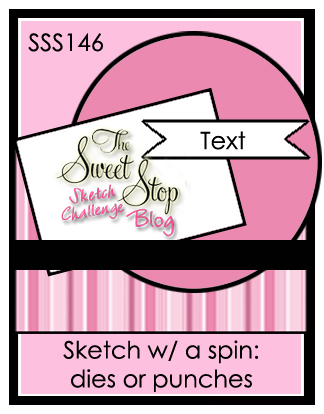 8-) Our spin this time is "To use Punches or Dies" 8-) So without further delay, here's my take on Miss Korin's Fabulous sketch and the spin..
How cute, Shannon! This little guy is sure to bring good luck and a smile to the recipient! You've created the perfect St. Patrick's Day card! Have a fabulous weekend! I love this! I had to come over from the Sweet Stop blog to see it up close and find out which stamp it was. My ds is a St Patty's baby and is turning 18 this year. This will be the perfect digi for his card!! TFS! What a sweetheart he is! He is bestowing a special gift, right? Just to you? :-) Love the green and grey combinations, with a touch of tan. Pops your little turtle perfectly! Your shading is impeccable, Shannon! Thanks for sharing. TOO, TOO CUTE!!! Love that image and the sketch...and all that wonderful green! Precious card Shanon. Just makes me happy all over. Your name is "Shannon" and you're Irish? Who knew?! *wink* This is really a cute turtle and I love how you colored him! 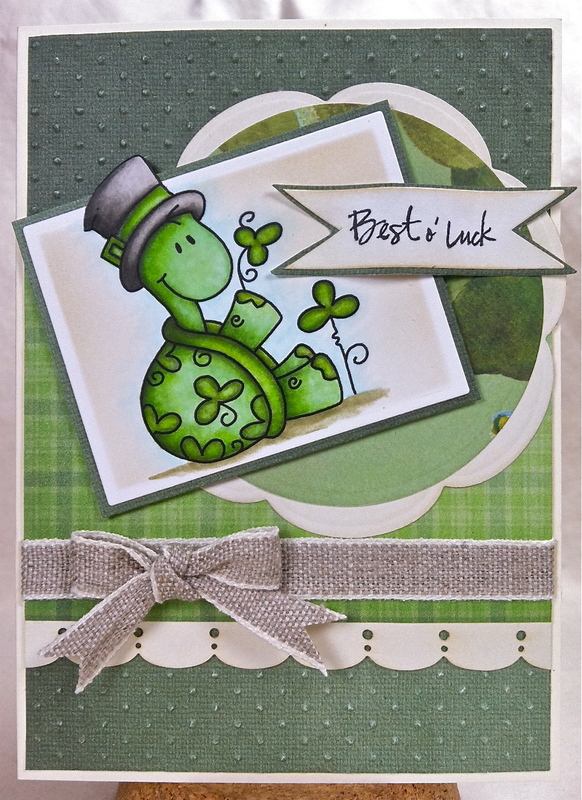 That sweet little bow and soft plaid dsp wrap this creation up perfectly for a fun St Patty's day card! Love it!! Ahhh what an adorable image. That wonderfully colored turtle is just too too cute. Great intrepertation of the sketch. Adorable card Shannon! That little turtle is oh so cuuute! Love the embossed background! Oh what a CUTE little turtle!! Love how you colored him! Oh my word, LOVE your coloring on that CUUUUTE turtle, Shannon! Great job with the sketch, too. How darling is this?? Totally love that little turtle. I love the sketch. Need to make a card tonight - I think I'll use it. Great job Shannon. Thanks for the inspiration. so cute Shannon! Adorable creating! You did it again!! The best holiday card maker ever... that's what you are:) Love the papers and adorable turtle. Aww he's gorgeous Shannon! what a cute image! I love all the delish papers and shades of green and the embossing and ribbon are beautiful !! Fun sketch and uber cute card! Your Copic coloring is always so perfect. Love the stamp! Shannon, this is ADORABLE card! I hope you are having a great week! Cute!!!! Your coloring looks so very good!